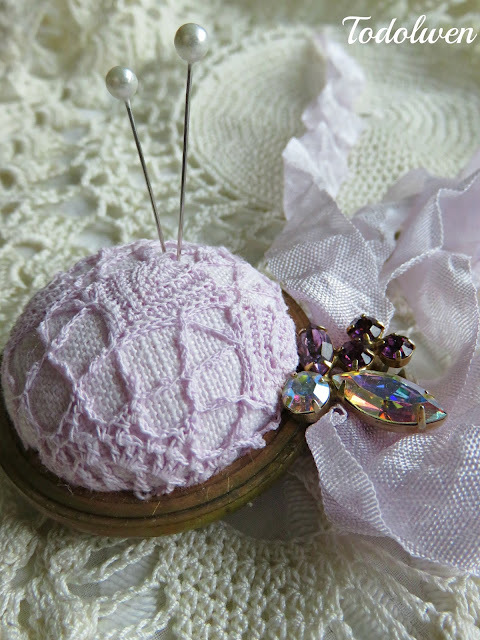 at last, I took a few photos that I am quite content with yesterday afternoon and now I am happy to share my newest creations, three pocket watch pincushions, with all of you. The pictures are a little lighter than they should be but that doesn't take away from how neat my newest makings have turned out. In reality the colors are a tiny bit more intense than they appear in the photos. After dyeing more bits and pieces I just knew, I was going to make some more pincushions using them and I have enjoyed making these lovely pieces so much. They are all made with the same concept ... old linen, seam binding, a pieces from a vintage doily that have been hand dyed in some very lovely shades of colors and of course an old pocket watch casing. 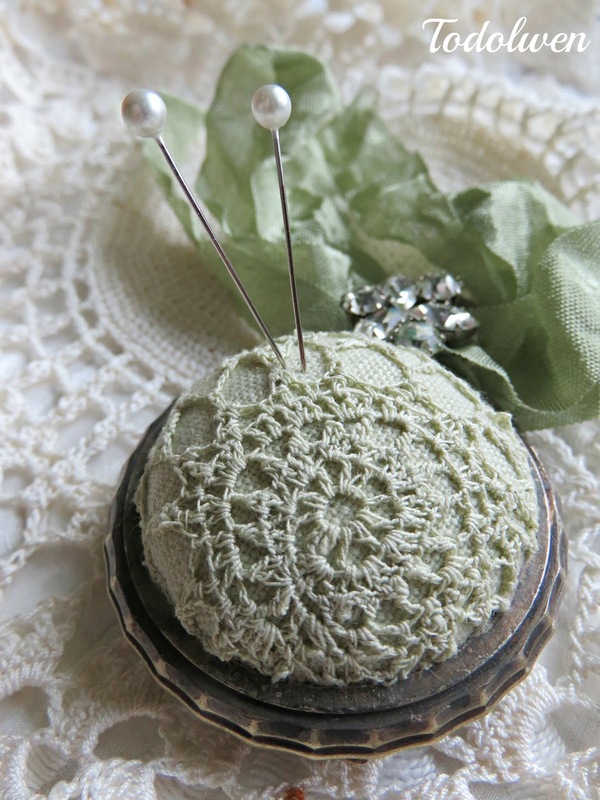 Each pincushion was given a vintage piece of sparkle that was perfect for it, as that final little touch. And here they are, my newest pincushions! 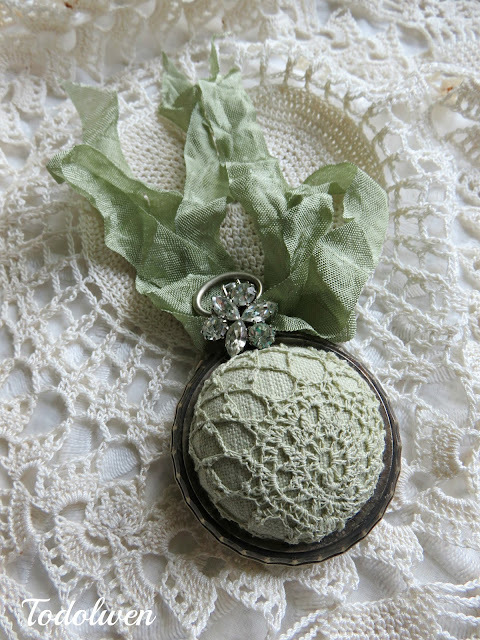 It is made in different delicate shades of green and is just so pretty. 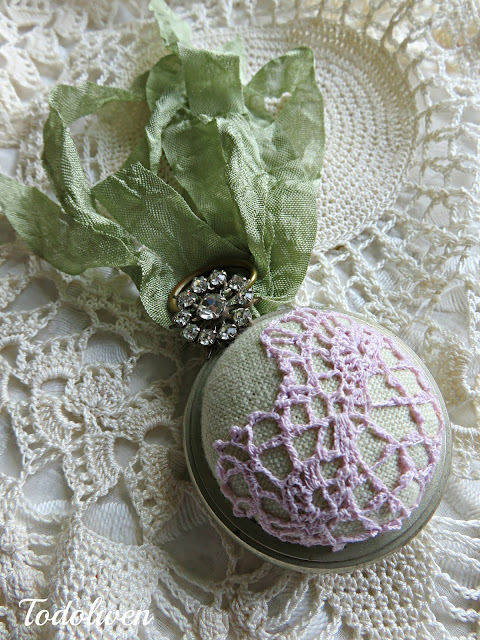 This one is made with some of my green and purple dyed bits and pieces and again I am quite happy with it too. 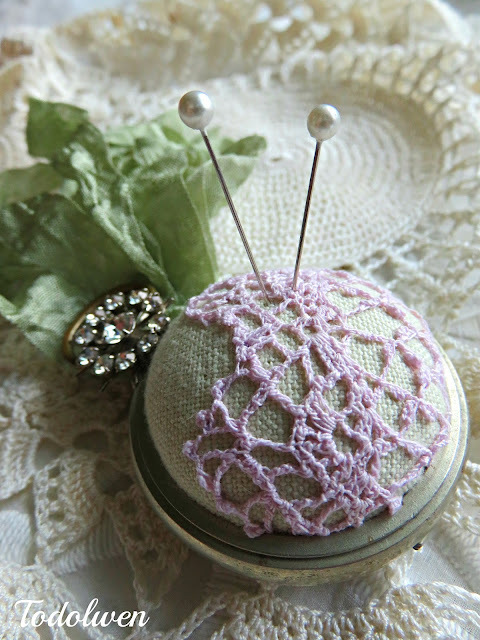 And last but not least, my third and last pincushion that I am sharing with you today. I named it ... "A Hue Of Purple". 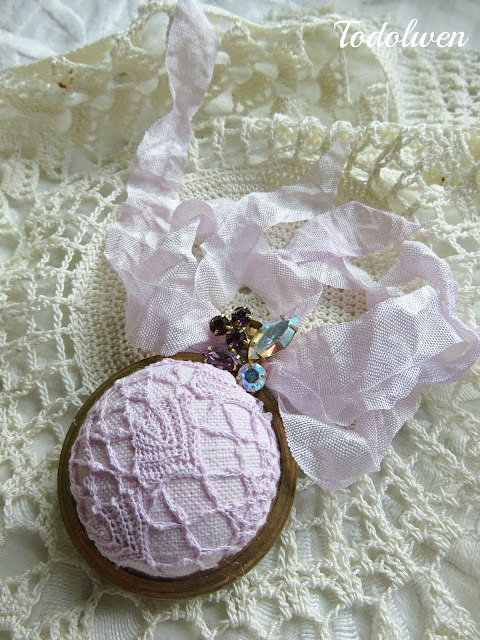 It is made in shades of very light and delicate dyed purple lace, linen and seam binding. There is just something about these delicate and very subtle colors that is taking hold of me right now, making me want to use more like them which I am sure, I will in the future. I still have some other finished creations to share with all of you, I just have to find the time to write the post to go with them again. It seem that all sorts of other "things" keep me busy and away from doing so today. but maybe later on this evening I will be able to get it done, so fingers crossed. More pretties! I think my favourite this time is the green. Just beautiful! Happy Wednesday. Have a great summer day. Will you be selling these on Etsy? They are just so beautiful, I can't decide which one I love the most. yes, I will. Hopefully I will have them all listed next week in my shop.